This small bowl is in amazing condition for having been alive and in circulation since the 1890s. It is one of the very early pieces produced under the Doulton Burslem mark that preceded the company becoming the familiar and highly respected Royal Doulton china firm. The story of Daulton Burslem goes like this. In 1882, the Doulton Company purchased the small factory of Pinder, Bourne & Co, at Nile Street in Burslem, Staffordshire, which placed Doulton in the region known as The Potteries. It began turning out fine ceramic ware marked Doulton Burslem. The stamp shows the Doulton Burslem name with a crown above and the word England below. This narrows the production date down to In 1891 when the company was appointed as potters to H.R.H. the Prince of Wales and a crown above the Doulton Burslem mark and the word England below was now added on each dish. It was not until 1902 when the Prince became King Edward VII and Granted a Royal Warrant that the world Royal was added to the Doulton name and mark. This places the likely production date of this piece prior to 1902. The bowl's style with a hand painted design also places it in the early era of Doulton china, as most of the later pieces used transfer designs rather than hand painted ones. Additional features of this piece that make it a very desirable antique are the unique irregular shape of its top edge and its beautiful condition with no evidence of chips, cracks, crazing, or wear to the paint. 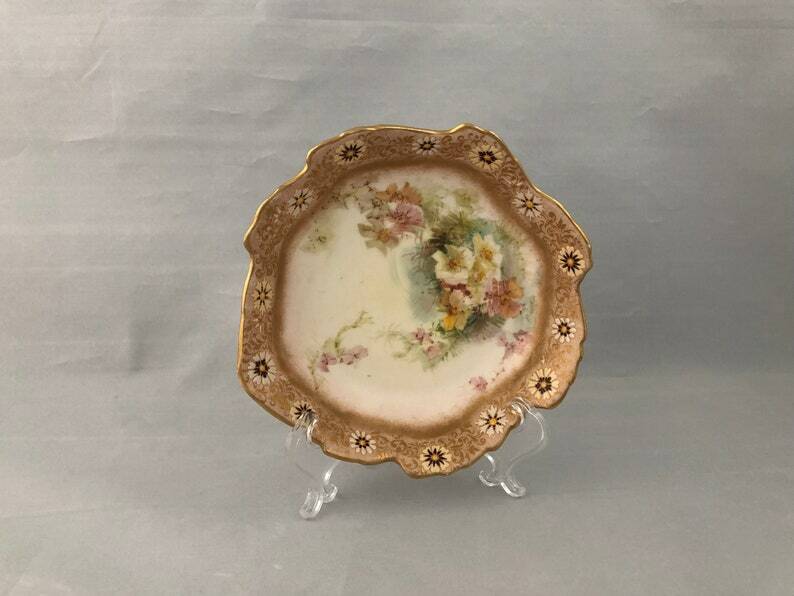 It would make a great gift for an admirer of antique English china, as well as a very useful piece to hold trinkets, jewelry, or a bar of soap on your vanity.